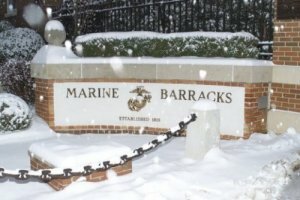 Any portrayal of a Marine’s life at 8th & I always focuses on “Quarters No. 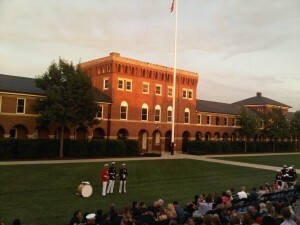 1,” the home of the Commandant of the Marine Corps, which stands at the North end of the parade deck. 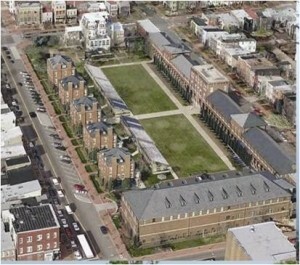 It is the oldest continuously occupied federal building in the City of Washington, D.C., and is the ceremonial center of the Barracks. 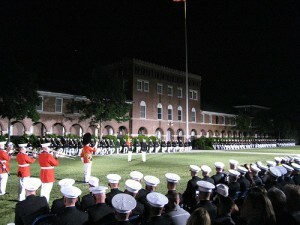 Each year begins with an age-old custom, the early-morning January 1st “Commandant’s serenade” by the Marine Band. 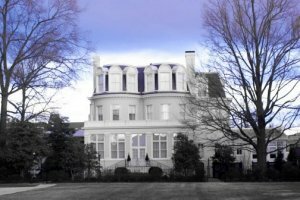 A beautiful building, it is the scene of many official parties and ceremonies. 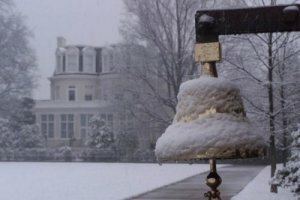 It is an imposing edifice, irrespective of the time of year. “8th & I” occupies a unique position in the Corps. As the oldest post in the Marine Corps, it has been entrusted with the Corps’ “battle colors,” adorned with multiple campaign streamers and battle stars commemorating every battle in which the Corps has fought throughout the history of our Country. The “Color Sergeant of the Marine Corps” is hand-picked from among all sergeants serving in the Corps, and represents all enlisted Marines throughout the world. 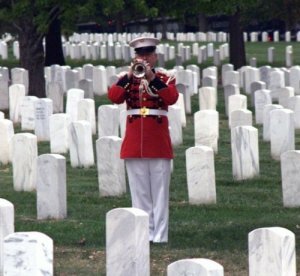 A primary mission of 8th & I is to participate in thousands of ceremonies, both in Washington, D.C., at Arlington National Cemetery, and at various locations throughout the world. 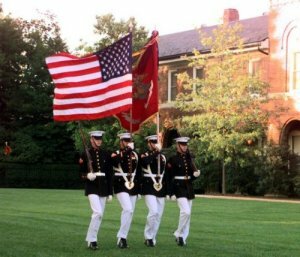 One of the most worthwhile events in Washington is the Friday “Evening Parade,” a stirring event which is presented from May until September. 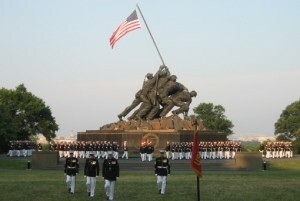 It is viewed by thousands of people every week, and is one of the most popular events in Washington. It features the U.S. Marine Band, the U.S. Marine Drum & bugle Corps, the Silent Drill Platoon, and over 200 Marines, all hand-picked for service at 8th & I. 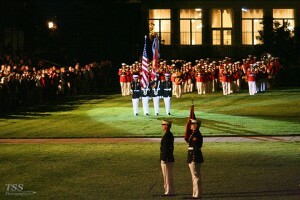 A scaled-down version of the Evening Parade is held every Tuesday afternoon at the Marine War Memorial, commonly referred to as the “Iwo Jima Statue.” It, like the Evening Parade, is a “formal guard mount,” involving the U.S. Marine Drum and Bugle Corps, the Silent Drill Platoon, and concludes with the playing of “Taps.” It involves a company-size contingent of officers and men, about half the number involved in the Evening Parade. The “spit and polish” displayed by all 8th & I personnel applies to every manner of task. 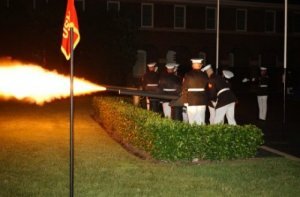 Nowhere else in the Marine Corps will you see Marines firing weapons in their “dress blues” as they are seen doing here, in honor of a visiting dignitary. Apart from ceremonies, 8th & I is a beautiful facility. One is immediately impressed even from the outside at the Main Gate. Once inside, the visitor is reminded that in addition to its business functions, it is a place in which people work and live, all seasons of the year. 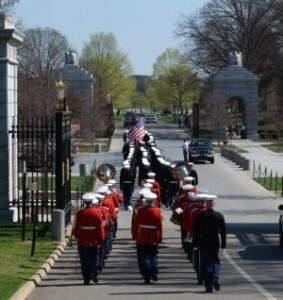 Arlington National Cemetery plays a large part in the life of the 8th & I Marine. It is there that final honors are rendered to Marines, and there is no duty which is considered more seriously than honoring those who have served as fellow Marines, whatever their rank, vintage, or places in which they served.